The Benalla Gallery Café is housed within the Benalla Art Gallery so you are able to enjoy great food and a drink, as well as enjoying great art, all while overlooking the picturesque Lake Benalla. The Benalla Street Art committee, a local volunteer group, have raised significant amounts of money from the local business community, crowd funding and grants to stage the annual Wall to Wall festival, a street art event where international and national street artists converge on Benalla in March to create world class murals on buildings through the town. The work is of a very high calibre with one work by Adnate voted number 8 out of 100 in the global Wide Walls awards. Winton Wetlands - We have some great wetlands 10mins drive away, or 17km on your pushbike. There is a winding bike trail around the Winton Wetlands which is currently being extended. So, to all the cyclists out there looking for a different experience, here's one for you. There are several shelters along the way, which include information boards. Benalla Street Art mural arist Guido van Helten has created a mural on the CFA water tank at the wetlands as part of the 2016 Wall to Wall festival. As at 16/2/15 there have been 180 different species of birds identified out there. Also for anyone wanting to see loads of our bounding kangaroo friends, well ... this is the place to go for that as well. The Walupka Woka Ride in May 2015 was a kind of opening introduction to the area. See the link attached here http://wintonwetlands.org.au. There is now a new Cafe opened, The Hub, Open Wed - Fri from 10am till 4pm and Sat and Sundays 8am till 4pm. If you are fascinated by Australia's history, then a visit to the Costume and Pioneer Museum is a must. The museum, as the name implies, specialises in costumes which date from 1770 onwards and are displayed in three large galleries and several smaller rooms. The exhibitions are changed regularly so with every visit you can view a new collection or theme. Benalla is renowned for its gliding conditions, with both thermals and waves. The Benalla Gliding Club and The Gliding Club of Victoria attract gliding enthusiasts from all around the world. The Benalla Gliding Club has an excellent website crammed with information and tools and is well worth a visit. Hot air ballooning competitions are also held regularly at the Gliding Club. BPACC boasts a state of the art auditorium with a capacity of 344, three professional meeting rooms (with access to a further three rooms within the TAFE complex) and a large foyer area for the comfort of patrons. These superlative facilities make BPACC the ultimate choice in hosting business conferences, theatre, conventions, meetings or community events. State of the art equipment and facilities at BPACC complement every event with high quality, professional and first class service. Winton Motor Raceway is situated a short drive 8km from The Glider City Motel in an area of undulating hills and farmland. We are the first choice for many motor sport enthusiasts wishing to enjoy the exhilaration of Winton's motor sport. 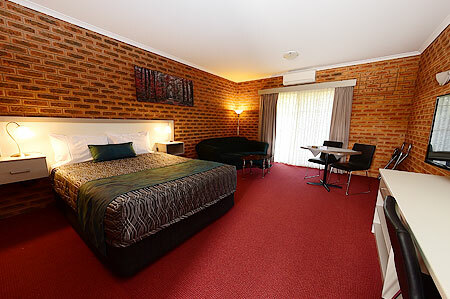 The Glider City Motel is located 3.5km from Benalla Racecourse. Since 1980 Benalla Racing Club has been an asset to the community, hosting quality race meetings and fine entertainment. Benalla Racing Club hosts 11 race meetings each season. Back in 1984 The Benalla Toyota Benalla Gold Cup was the lead up race for Black Knight in preparation for his Melbourne Cup triumph. In modern times Makybe Diva made her race debut at Benalla and three-time Group 1 winner Yosei broke his maiden status on the turf at Benalla. The Club provides a family-friendly racing experiencew through access to high-quality facilities and on race days the Club has a host of entertainment options for an enjoyable race day with friends, family, colleagues and clients. The Glider City Motel also has an 11 seater courtesy bus and can organise group drop offs to the racecourse for the day. A fantastic plant nursery set up. You won't believe you are actually in Benalla. Established over 30 years ago, Green 'n' Grow is now regarded as one of North East Victoria's premier garden centres. Busloads of people visit especially, from all around the state. They offer plants, seeds, bulbs, ornaments and statues, trees and shrubs, peacerful water features, gift ideas, soils, sands and gravels, garden tools, fertilisers, peat moss and mulches. It is a popular and beautiful backdrop for weddings, with extensive grounds, immaculate lawns, mature trees and shrubs coupled with lakes and water features. The Shady Elm Coffee Shop is located within the nursery and is a lovely spot to relax and eat, surrounded by greenery and birdlife.